Last year I worked on my first calendar project with Amber Lotus Publishing. The topic was something I was vaguely familiar with: urban chickens and their coops. I’ve done a fair amount of assignment work photographing various gardens and a few stories about people who have urban farms, but this was the first time I’ve worked on a project specifically for a calendar. The 2013 version is now available either directly from the publisher or on Amazon.com. I’m sure you might run across this in garden stores too! It was great fun working with each coop owner as every chicken coop had wildly different personalities. It was also wonderful meeting the ladies, who turn out to make not only great pets, but also great eggs. I’ve posted a few photos from the shoot on my stock photography site and will add more in the near future. This is the perfect gift for anyone who keeps chickens as the coop ideas featured in the calendar are all very original. We photographed the 2014 calendar this past summer and it was neat to be able to show those coop owners the ideas that are featured in the 2013 calendar. 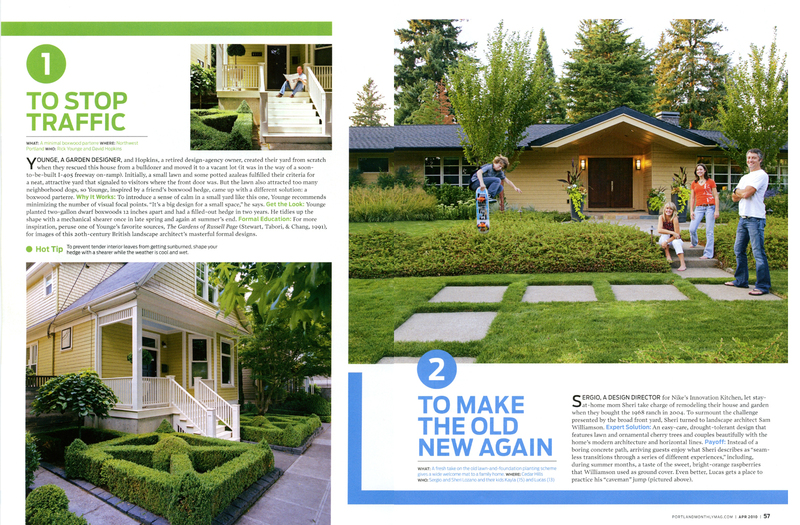 It is with great pleasure to announce the publication of a story that I shot last July here in Portland for Garden Design Magazine’s Green Living section. The garden belongs to Maryellen Hockensmith and has a mid-century Modern designed Pietro Belluschi home on the property. Maryellen’s life partner, Michael McCullock, who is an architect, designed the yoga house and the design of the garden was a joint effort by a team of regional designers including Ann Lovejoy, Beth Holland, Eamonn Hughes and Laura Crockett. There is a saltwater swimming pool and views of the coast range along with outdoor rooms, an amazing stone fireplace and cascading waterfalls. Lee Kelly was commissioned to create a large piece which is entitled, “Window to the Gone World” that both captures views of the garden and frames the coast range in the distance. Although it was July, while I was shooting the weather ranged from the 40’s at dawn to up into the 70’s during the day. There was a marvelous bee balm “hedge” that attracted many hummingbirds, which were my constant companions during the shoot. It’s a marvelous garden with the added bonus of enlightened and generous homeowners who are good stewards of the earth. 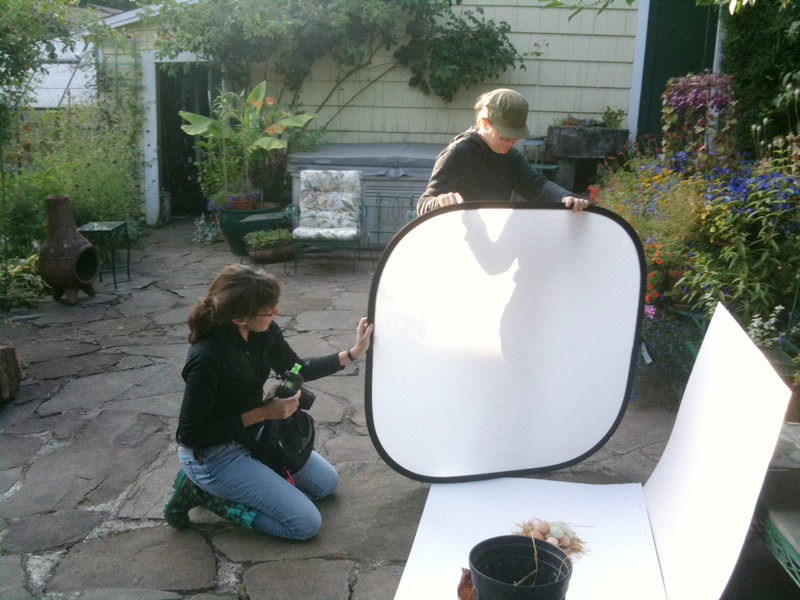 You can check out the story on Garden Design’s web site here and see outtakes from the shoot on my Stock Photography site here. All the images were shot with Canon’s 5D Mark II and various lenses. 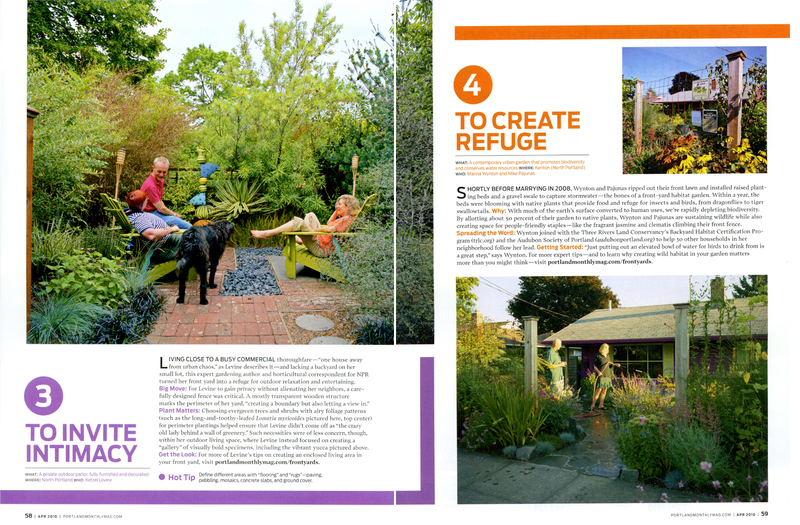 One of my first assignments was for Garden Design Magazine back in 1998. It was shooting a story about a landscape designer in Los Angeles named Chris Rosmini. She not only had an extraordinary garden in the middle of the city, but she also had amazing collections of things. Suitcases, alabaster statues, and other ephemera were strewn through her three bungalows. 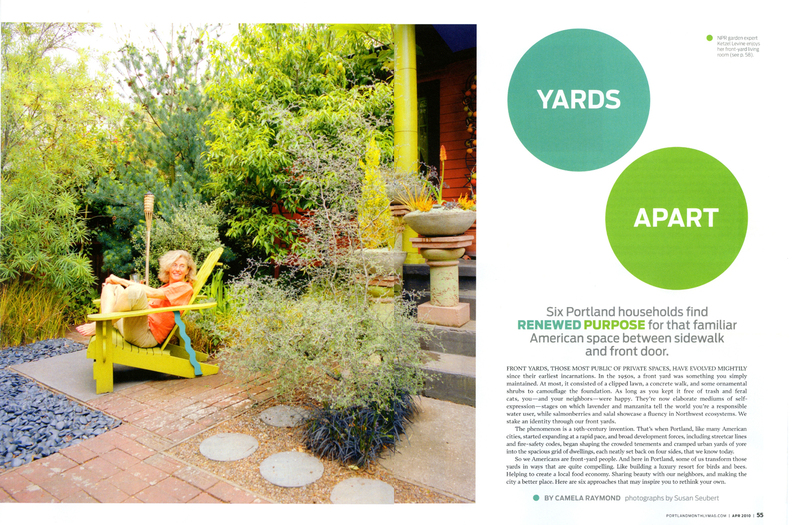 Last summer I was asked by Portland Monthly Magazine to shoot a series of front yard gardens. The assignment was not nearly the deep investigation of space that the Rosmini story was, but fun and a way to learn about garden design from a completely different vantage point. Here is the story which is running in the April 2010 issue. The images were made with a Hasselblad Camera shooting with Kodak 160VC film and a few of the pictures were made with the Canon 5D Mark II with a 24-105mm Lf/4 IS USM lens.